For today’s Throwback Thursday selection, I give you one of my most favorite pictures of my paternal grandfather – and I hope you will please excuse the whole “picture of a picture” situation, but when you take a good look at all this awesomeness, I think you will. I actually never met my grandad, as he passed away when my father was barely a teenager, but the few photos my father has of him and the stories I have heard, manage to make me miss him. 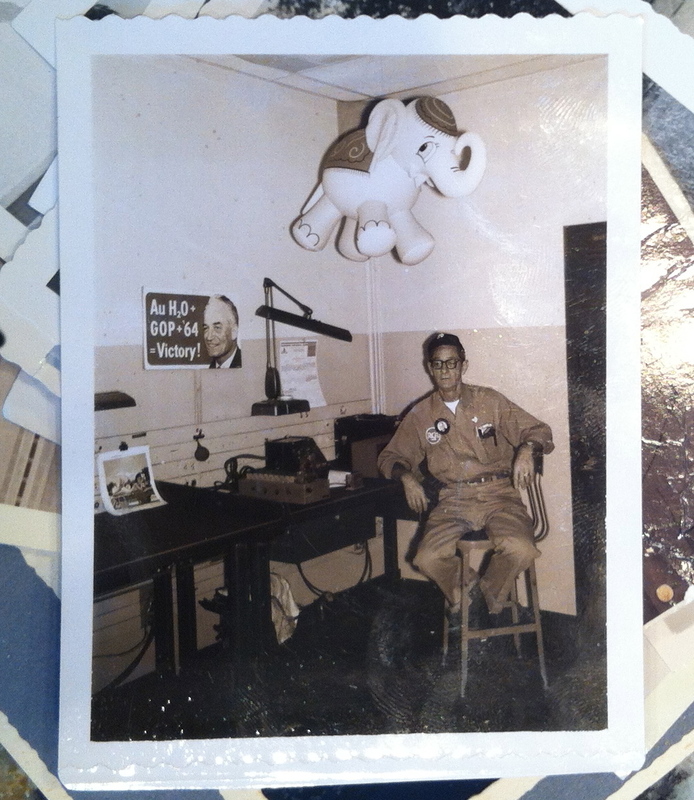 Here he’s pictured at his work bench at RCA (interestingly both of my grandfathers worked with radio/technology after they were in the service), and his work clothes are definitely rad, but my favorite bits in this picture are the Barry Goldwater election sign and the inexplicable elephant hovering above his head. Do we think my grandad was a fan of elephants? Maybe he won it at a fair or had recently visited the circus with the kids? Or perhaps he was just a staunch Republican? I love this photo, and the mystery behind it. Great photo and post. You are currently reading Throwback Thursday: Elephant in the Room at Quite Continental.